This print was made for the Atlanta Printmakers Studio as the second in their Collectors Print series. Conceived during the devastating BP oil spill in the Gulf, “Trap” refers to a dangerous or untenable situation. While listening to the news reports of the oil spill one repeatedly heard evocative terms like top kill, blow out preventer, containment dome, and dispersant. The image of the hourglass became the symbol of contained pain or disaster. 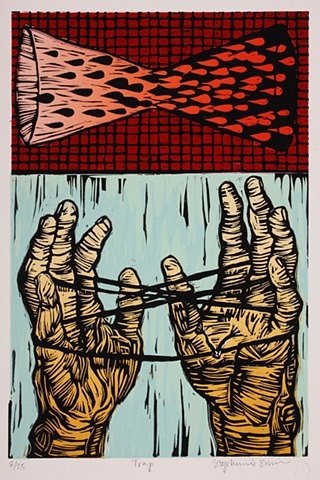 The image of the child’s string game Cat’s Cradle represents an innocuous situation or one that begins as play but which quickly and unexpectedly becomes serious or dangerous.